Her poetry and essays were written in such a way as to confirm her radical and feminist views. It is generally acknowledged that her literary efforts were most certainly influential in raising the profile of women in general and lesbians in particular. She was also a university tutor. She was born Adrienne Cecile Rich on the 16th May 1929 in Baltimore, Maryland, the daughter of a renowned pathologist and a concert pianist and composer. Although her father was Jewish, Adrienne and her sister grew up as Christians and she was actively encouraged to write poetry by her father who had a well-stocked library containing works by Tennyson, Keats and Blake amongst many other greats in the literary world. He was extremely keen that his daughters would excel in whatever field they chose and, in the early years, they were both tutored at home by their mother. Adrienne’s formal education began at a good girls’ high school and she then went on to study poetry and writing craft at Radcliffe College. This was a change from her earlier education in that all of her tutors there were men. During her final year at Radcliffe she produced a collection of poems called A Change of World, and this was recognised by the poet W H Auden who nominated the collection for the Yale Series of Younger Poets Award. She then received a Guggenheim Fellowship which enabled her to go to Oxford. Her time there was interrupted by a visit to Florence and she was so inspired by what she saw there that she decided not to return to Oxford, choosing instead to travel Europe. At the age of 24 Rich was married to a Harvard professor and she settled to her new life in Cambridge, Massachusetts. Two years later she had a second collection published under the title The Diamond Cutters, and she received an award from the Poetry Society of America that same year. More awards would follow during the 1960s, a decade which would see fundamental changes in her lifestyle and outlook on life in general. In 1963, for example, she published her third collection of poems which were an exploration of her femininity which had been tested during the 1950s by marriage and the birth of her three children. This set was called Snapshots of a Daughter-in-Law. Much later on, in 1982, she also delved into her confused religious identity with an essay titled Split at the Root: An Essay on Jewish Identity. Before this though, Rich moved her family to New York in 1966 and she began campaigning on civil rights, feminist and left wing platforms and was a strong voice against the Vietnam war. Her writing output remained prolific with three more collections coming out between 1966 and 1971 including The Will to Change (1971), all of which underlined her increasing radicalism. Tragically, all of this led to the death of her husband in 1975 who, fearing that his wife was “losing her mind”, took off into the woods one day and shot himself. 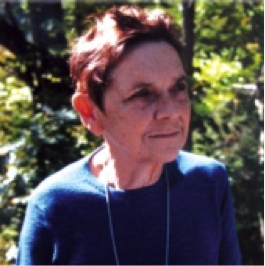 Adrienne Rich died on the 27th March 2012 at the age of 82.